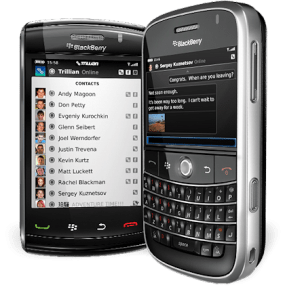 The popular and venerable multi-network IM program Trillian is now available in an open beta test for Blackberry devices. Like the other versions of Trillian, this supports the major instant messaging networks including AIM, ICQ, Windows Live Messenger, Yahoo! Messenger, Google Talk, MySpace and Facebook. It allows you to manage meta contacts (one of the nicer features of Trillian) as well as send and receive photos and files. Note that this is a time-limited beta version that will expire when the final version is released. Learn more about Trillian for Blackberry or download it now.